Boaters migrating down the Carretera Austral inevitably flock to the Piedra del Gato overlook to check out the Río Cisnes. For good reason, this roadside canyon is a great place to unwind and stretch your legs after circumventing the southwest corner of Cordillera Queulat. If you decide to paddle the Cisnes, you’ll find some tough, intermittently spaced class IV rapids, with a possible portage around the rapid that you can see from the overlook. From Puyuhuapi, 199 km south of Chaitén, drive south through Parque Nacional Queulat. 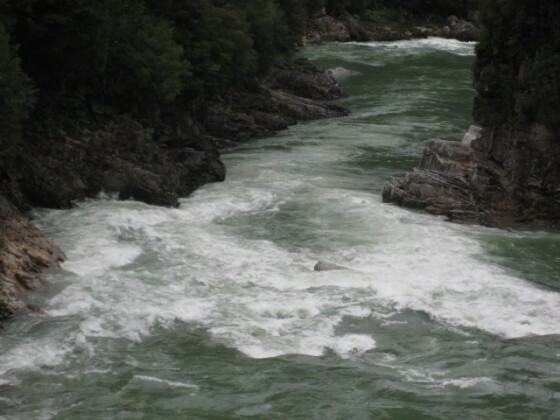 Take out 1.5 km downstream from the Carretera Austral/Puerto Cisnes junction, where an obscure trail on river right winds down to the shore elevation 120 meters. Look for the trail below an island roughly 500 m after the last class IV rapid. Put in approximately 10 km upstream on the Carretera Austral, where a small break in the forest leads down to the river to elevation 200 meters. A friendly roadside hosteria at km 140 near Puente Río Cisnes has a hot shower. If you want to drive to the 33 km to the coast, excellent fresh seafood can be purchased in Puerto Cisnes. This stretch is runnable year round. 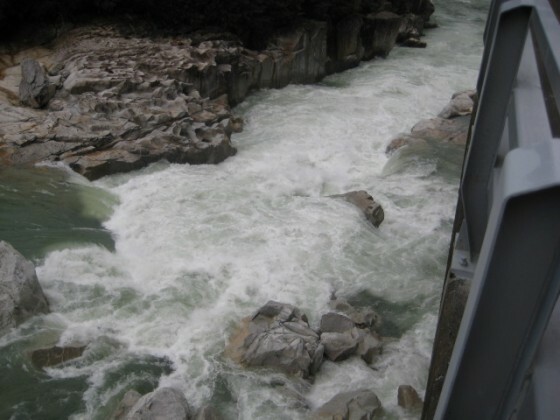 Normal flows are 1500 to 1800 CFS but can get big after sustained heavy rains. The 10 km stretch class IV•IV+ stretch has average gradient of only 8 mpk or 40 FPM but still features some good class IV action especially at high water. yesterday we ran the middle Cisnes (put-in at Puente Rio Grande and Take-Out at Piedra El Gato, described in the Chile Guidebook). About 1km before the takeout (the river is already roadside) there is a huge new siphon immediately after a rapid. It might work to sneak around on the left, but 90% of the water goes into the siphon on the right. As it is hard to portage we decided to take-out there (road is close).